Congratulations to Amy C. Hanson, 2014 Joel Workin Scholar! Extraordinary Lutheran Ministries announces the 2014 Joel R. Workin Scholar, Amy Christine Hanson. 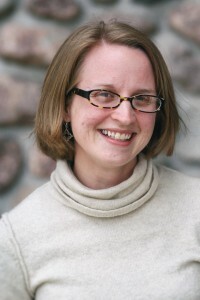 Amy Hanson is the 2014 Joel R. Workin Scholar, an award created to honor the legacy of Joel Workin, one of the first openly gay seminarians in the Lutheran Church. Amy recently graduated from Iliff School of Theology in Denver, Colorado. She completed her Lutheran formation classes at Luther Seminary in St. Paul, MN last year. She is currently serving as an intern pastor at First Lutheran Church of St. Peter. Amy has been certified as an ELCA Mission Developer/Redeveloper. During and prior to seminary, Amy worked with a number of social service agencies, including Delores Project and Denver Urban Ministries. Amy is a member of House for All Sinners and Saints, ELCA, in Denver, CO.
“We were compelled by your resume as well as your letter of recommendation, but your essay stood out to us most of all. You have a gift for language and for weaving together personal narrative with theological exploration. We loved the way that your writing both reflected your unique voice and engaged in lively conversation with Joel’s sermon. Many of the members of the committee spoke appreciatively of how the warmth and openness of your essay invited us to get to know not just what you think, but who you are. Each year ELM names a Joel R. Workin Scholar to honor the life and ministry of Joel Workin. Joel was one of the three gay seminarians who were refused ordination in 1989 after “coming out” to their candidacy committees. This award comes with a $2,500 scholarship for academic or spiritual study and is available for publicly-identified lesbian, gay, bisexual, transgender, and queer Lutheran seminarians who are members of Proclaim. The increased award is the result of increased contributions to the fund. The fund is managed by InFaith Community Foundation. Anyone interested in making a planned gift to the fund may contact Amalia Vagts (director(at)elm.org). The Workin Scholar Selection committee thanks all who applied for the award. In the last weeks of his illness, Joel gave his friends and family permission to sponsor an endowed memorial fund in his name. The Joel R. Workin Memorial Scholarship Fund was thus established upon Joel’s death on November 29, 1995. Joel’s parents, Ray and Betty Workin worked with Michael Price Nelson and other friends of Joel’s to release a collection of his essays and sermons, called “Dear God, I am Gay – thank you!” The second edition was released in 2013. Information on receiving a copy of the book here. This entry was posted on Thursday, July 24th, 2014 at 1:32 pm	and is filed under Blog. You can follow any responses to this entry through the RSS 2.0 feed. Both comments and pings are currently closed.